Alice Pike Barney was an artist and patron who pursued her interests despite the wishes of her husband. She was born into a family that had grown wealthy by distilling and selling liquor, was raised in New York, and fell in love with Henry Morton Stanley, the man who discovered Dr. Livingstone in Africa. Her family did not approve of the match and Barney married someone her family found more acceptable. The couple moved to Cincinnati and Barney began taking drawing classes in 1885, had a painting accepted by the Paris Salon in 1889, and by 1898 was living there and studying with James A. M. Whistler. Her husband disapproved, and it was not until his death that Barney was able to fully explore her own talents and support the work of others. In the early 1900s, she built a villa for herself called the Studio House, which is now part of the Smithsonian’s National Museum of American Art. 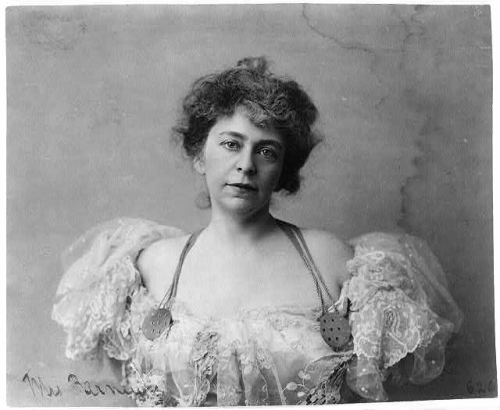 Frances Benjamin Johnston, Alice Pike Barney, circa 1890-circa 1910. Library of Congress, Prints and Photographs Division, Washington, D.C.